My wife and I made our first visit to Hoffman Hills since returning from vacation. We were curious to see if the Canada Geese had nested at the ponds again this year. We were happy to see one pair had nested on the first pond. Normally they nest on a small island in the middle of the pond but the last few years the water has been so high that they have been nesting on shore. One was on the nest and the other staged nearby watching as we approached. On the second pond we didn’t find any birds but there were quite a few Painted Turtles sunning themselves. Normally when we approach they slip into the water but this time they just continued to hang out and ignored us. After walking around the ponds we headed out into the Prairie area to check on the birds. We wanted to see if the Tree Swallows and Easter Bluebirds were nesting yet. The bluebirds were sitting on one of the bird houses and several pair of Tree Swallows were dive bombing them. The male stayed off to the side but the female maintained here position on the house to protect it from the swallows. There were a few flowers out. The Marsh Marigolds were out around the first pond and the Prairie Smoke was just starting to come out in the Prairie area. On the way back from Pipestone we decided to see if we could find the Touch the Sky Prairie. It was more difficult than we anticipated because the instructions in the local brochure were a little confusing. We discovered that the Prairie had also been recently burned. One part was black from the recent burning and another part had greened up. I took a few photos and we went back to town until later in the evening so we could get some evening light on the prairie. When we returned we decided to hike the area that had greened up. There is a small stream and waterfall in this section. The light was not very good for photographing the waterfall but there was some nice light for photographing the prairie. There appeared to be several buffalo rubbing stones in the prairie. These are stones that the buffalo rubbed against and in doing so polished them. My wife headed back to get the car and I walked out over the prairie to another parking lot. It was a mess hiking though the burned area my clothes were covered with soot from getting on the ground to take photos. I did see a huge Jack Rabbit but wasn’t able to take a photo of it. Because the prairie had recently been burned there were no wildflowers out although some of them were getting ready to bloom. More photos from Touch the Sky Prairie can be found on my website. I was taking a last look at my 2011 photos before sending them off to storage and decided to write a brief review of the years photographic experiences. Things started off with a bang with an early winter blizzard. Not only did January bring lots of snow locally but it created some fantastic ski conditions in the upper Midwest. 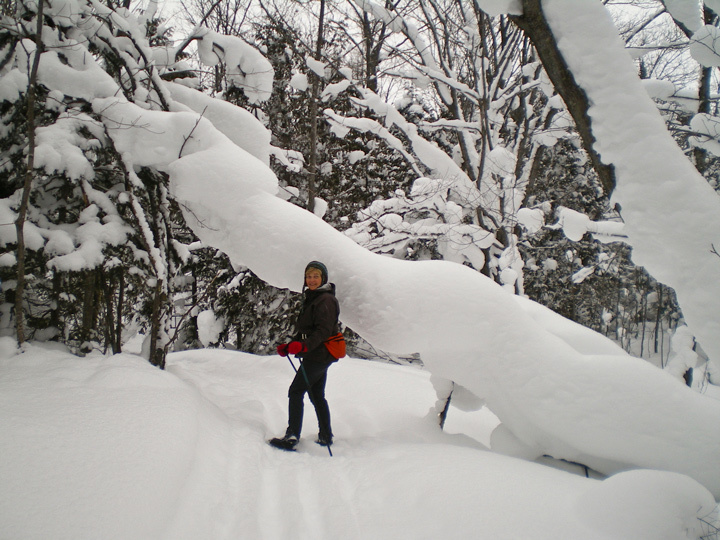 We made a number of ski trips to the U.P. of Michigan. Our favorite ski location was Swedetown. This is a shot taken on the Backcountry Trail. Unfortunately the log was removed because the groomer could no longer get the groomer under it with all of the snow. 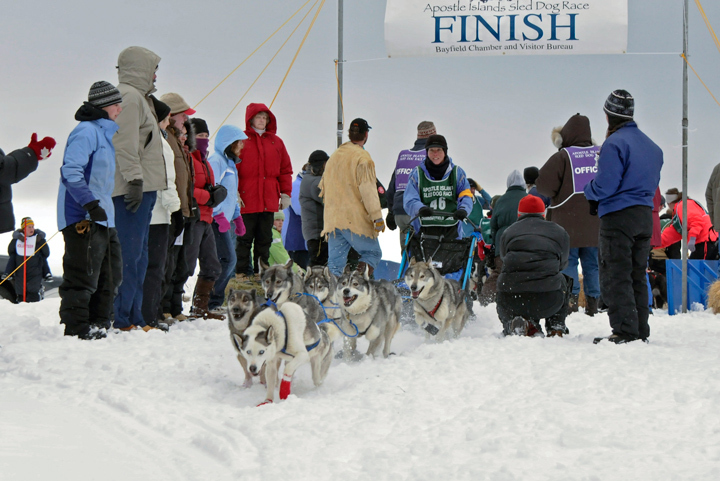 February was highlighted by a trip to the Apostle Islands Dog Sled Races in Bayfield, Wisconsin. I don’t think I’ve ever seen such a bunch of excited dogs as I did in the morning before the race started. The whole parking area was a scene of bedlam. Things were much different in the afternoon when they returned from a day of racing. There wasn’t a sound to be heard from the dogs. Their tongues were hanging out and all they wanted to do was eat and lay down. It’s a trip will worth taking for the family because you can get so close to the dogs. In late March we were planning one last trip to Lake Superior. Unfortunately nature had one last blizzard in store for us and were snowed in for a couple of days before the township was able to get all of the roads plowed. This was a massive storm that was supposed to hit the Duluth area with lots of snow. The weather pattern changed at the last minute and the snow dropped down into our area. When we did make the trip north we found almost no snow in the Duluth area. We had hoped to find some ice along Lake Superior but there was almost none to be found. 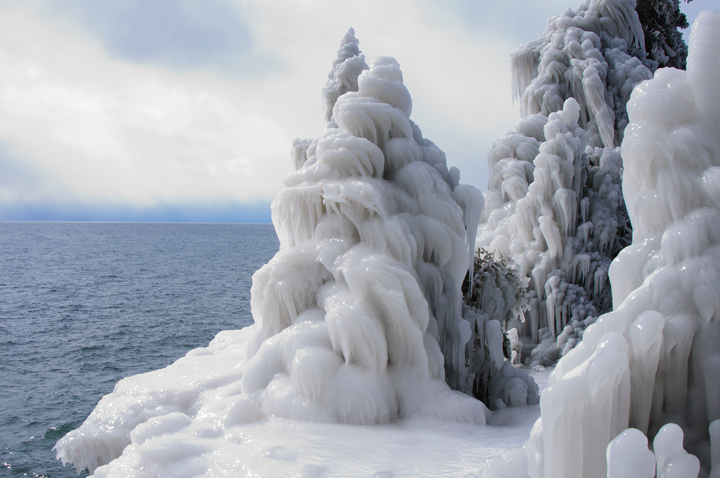 When we stopped at Tettegouche State Park we asked the ranger if there was any ice around. That started a surreal day of hiking through great fields of ice formations. The saga was documented in an earlier postfrom that day. The storm that brought us snow brought a strong Northeaster to the North Shore and created fantastic ice sculptures. April brought another trip to the Minnesota North Shore. Amazingly most of the ice was gone and the spring snow melt was under way. This is a shot of the Cascades in Cascade Falls State Park. 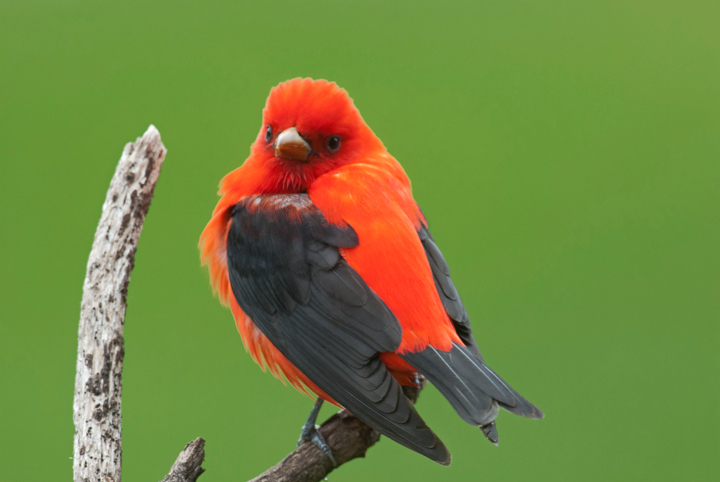 The highlight of May was a visit to my bird feeder of a pair of Scarlet Tanagers. I have rarely seen Tanagers and had never gotten photos of them. The male showed up one day and as soon as I saw what it was I raced for a camera. I photographed the male and then the next day the female turned up at the feeder. They were both feeding on suet. By the third day they were gone. 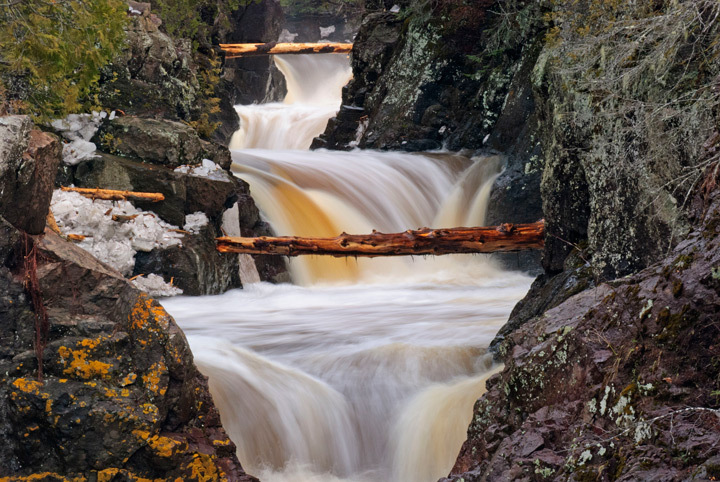 In June I made another trip to the Minnesota North Shore. 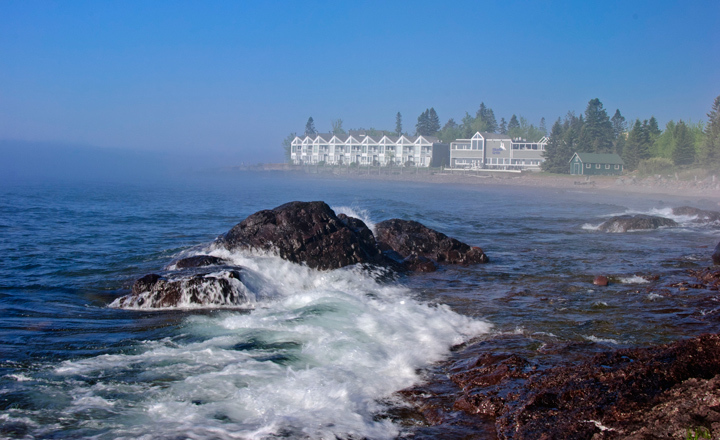 Driving south from Grand Marais I noticed the fog moving in and out around Bluefin Bay. I stopped at a gas station for some coffee and then drove back to watch the fog in the early morning light. I July I spend most of my time photographing insects and flowers. 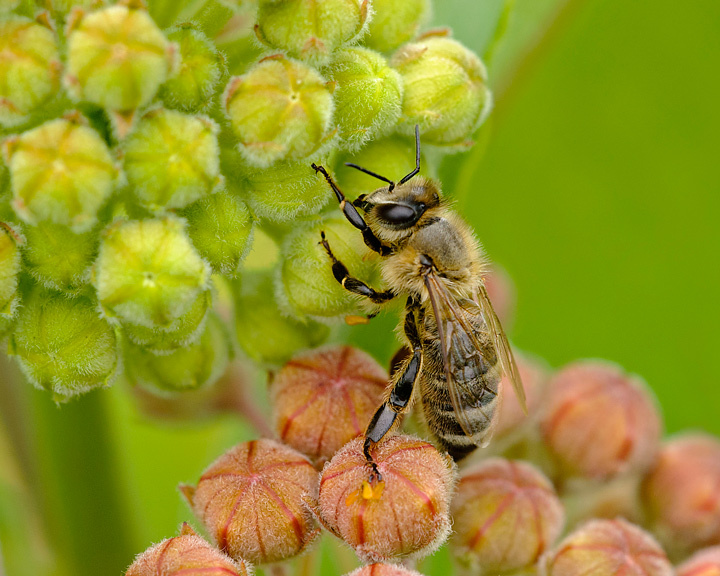 I happened to catch this Honey Bee on a Milkweed plant that was just starting to bloom. 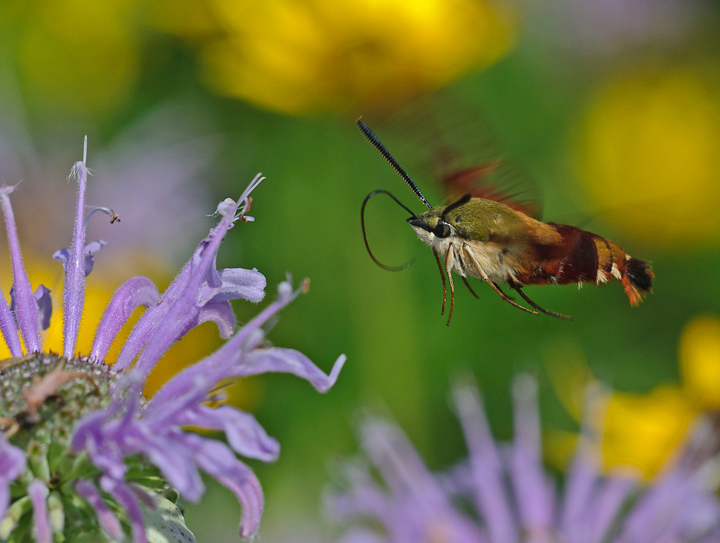 August brought an invasion of Clearwing Hummingbird Moths. I had seen them along the Red Cedar River several years ago but had never seen them on my farm or at Hoffman Hills. This year they were everywhere so I spend a considerable effort to try and photograph them. I suspect I will never see as many again. In early September my wife and I made a trip through the U.P. of Michigan. 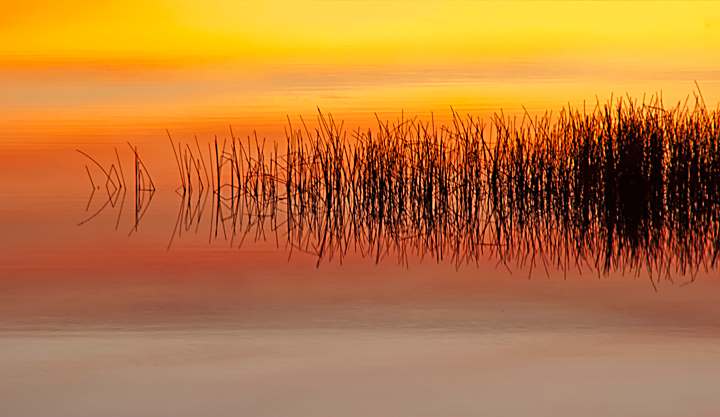 We had planned on spending an night in Seney so we could photograph the sunset at Seney Wildlife Area. Through a stroke of luck I managed to capture my favorite photo of the year. We had not seen clouds during the day but as evening approached clouds formed in the western sky. 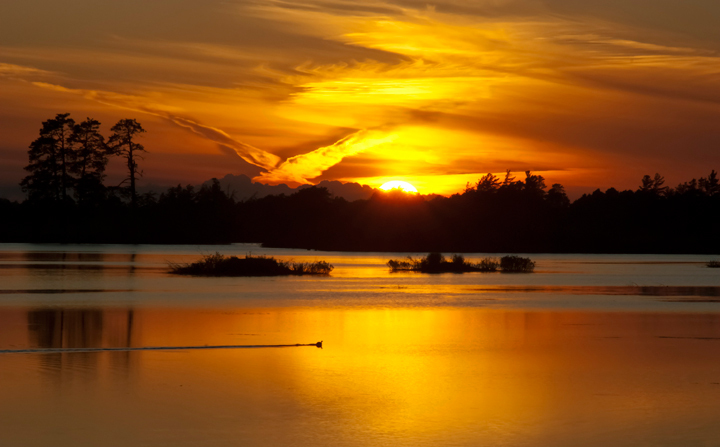 We were late in arriving at Seney and sunset was already well underway. In addition, there were some contrails in the sky. I wasn’t happy to see them but continued to photograph the sunset. As the evening progressed th clouds and contrails combined to create an image of an eagle in sky making for a memorable photo. 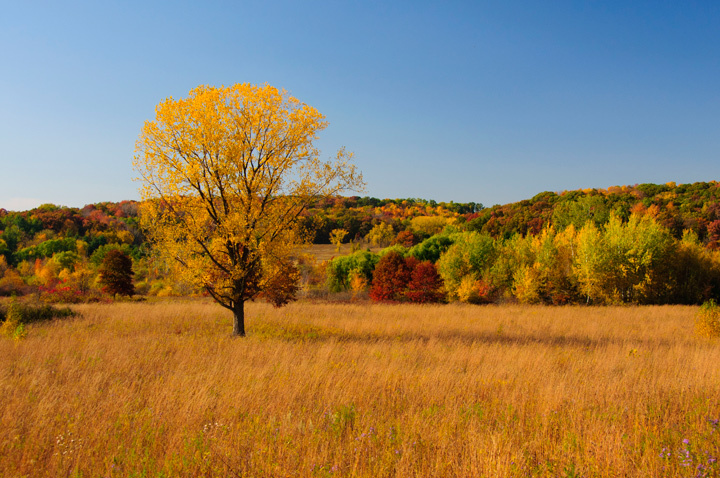 One of the benefits of living in the upper Midwest is the fall color displays. I had to work hard to capture them this year because just as the fall color season was starting strong winds also started blowing. They continued throughout the fall and took the leaves down almost as soon as they peaked. This photo was taken in Rusk County in northern Wisconsin. In November I usually make my way to Crex Meadows near Grantsburg, Wisconsin to photograph the fall Sandhill Crane migration. In November there can be as many as 14,000 Sandhill Cranes residing in Crex. On this particular day I had intended to drive out to where the cranes were roosting and not bother to stop for sunrise shots at Phantom Lake. As I drove past Phantom Lake I realized that there was going to be a spectacular sunrise. This was my favorite fall shot taken shortly after the sun came up. December was one of the slowest photography months I’ve had. We had virtually no snow until a 6 inch wet snowfall the first week in December. My wife and I quickly drove down to the Red Cedar Trail to take advantage of the fresh snow. Fortunately we did because it quickly melted and Christmas looked more like Thanksgiving with brown grass and no snow. 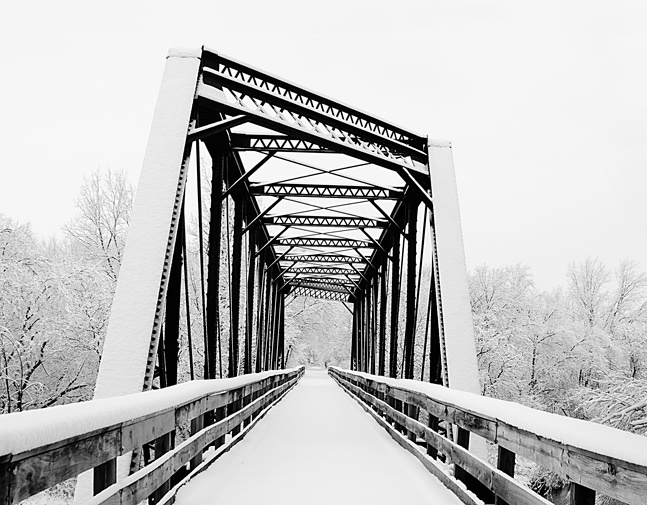 This is the bridge over the Red Cedar River. 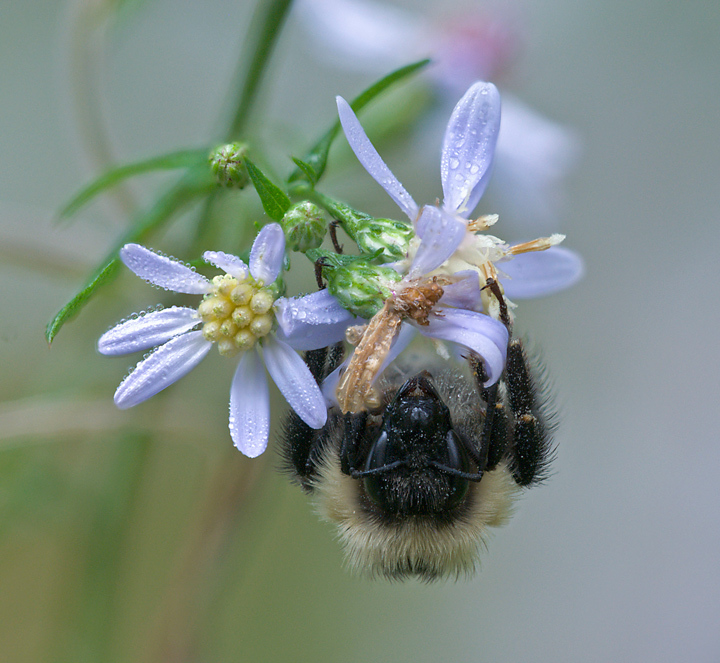 I was going to call this blog slim pickings because most of the summer birds are gone, there are only a few stray butterflies around and most of the fall flowers are done blooming. I’ve been out in the woods this past week cutting firewood and as I looked around it appeared that there was not much worth photographing. This past weekend I finally decided to break out the camera and see if I could find anything to photograph. Turns out I wasn’t looking close enough when I was cutting wood. Once I had the camera out I started finding quite a few things to photograph. 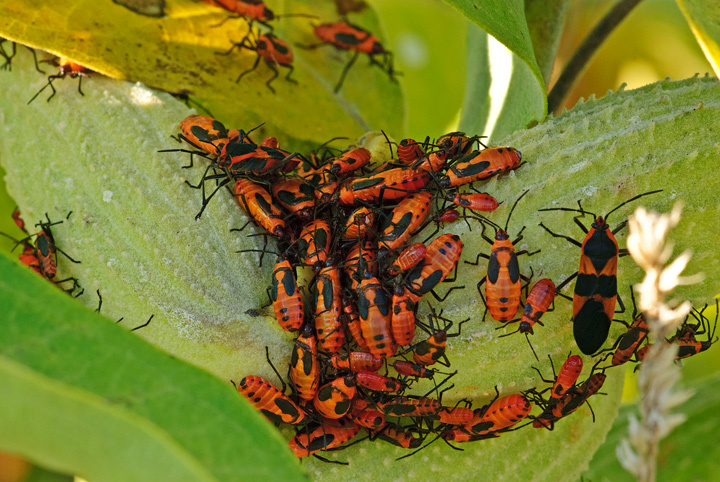 The milkweed bugs are out in full force this time of year. I’m a little surprised to still find some baby milkweed bugs around with the adults. In some places the milkweed is all dried up but around the house it is still green and it is the green plants where I’m finding the bugs. 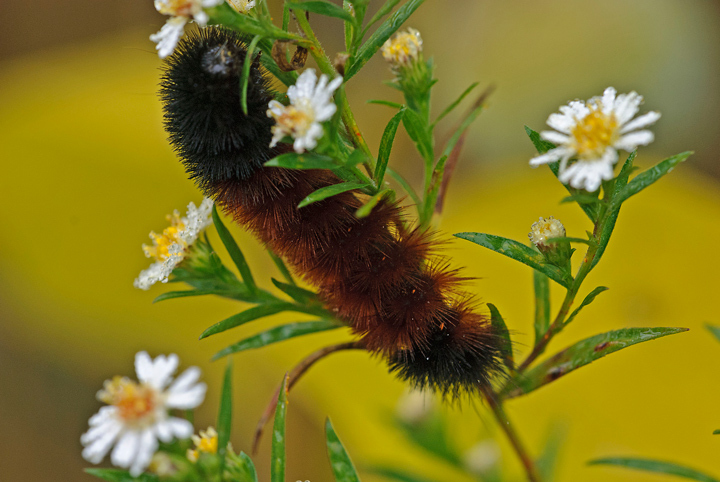 The woolly bear Caterpillar are also out in large numbers. I started to do some mowing in the prairie areas but decided to hold off because there are so many woolly bears around. I’ve tried to photograph them early in the morning but it is hard because they are usually spending the night under a leaf or a flower. I found a patch of what I think is Wild Mint. 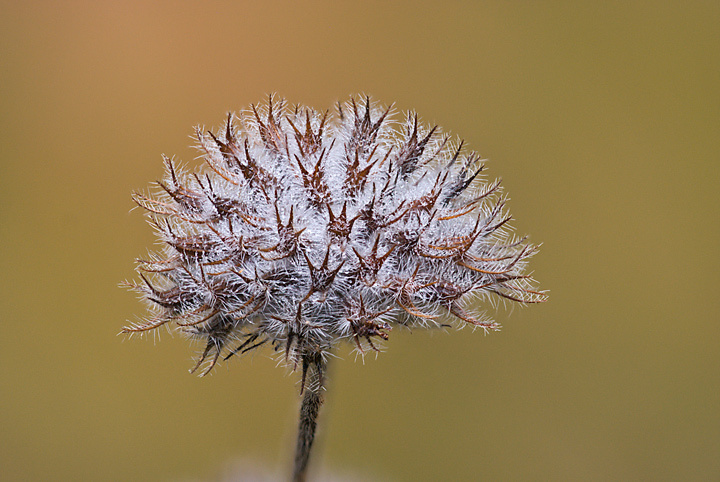 It has gone to seed but the seed head is interesting and I have been trying to get a photo of it covered with a heavy dew or frost. The grasshoppers are out in large numbers but they don’t seem to be willing to pose for photos most of the time. I have managed to photograph a few of them.. There are still bees around. I like to try and find them early in the morning when they are on a flower and not moving. Unfortunately they are usually hanging under the flower so it is sometimes difficult to photograph them. 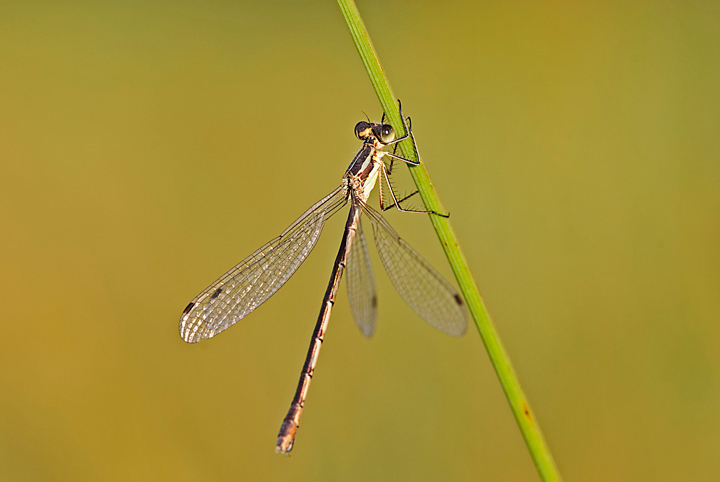 I have been see quite a few large dragonflies flitting about the prairie area but they don’t seem to be landing. I think they are migrating through. I happen to find this small one on some grass just before dusk one night. As noted in an earlier post the Sumac is in full color now. Sumac is the first to turn and a sure sign of fall.